Welcome to our penultimate newsletter of 2018.
week to concentrate on other pressing business matters, a big thanks to those of you who came to visit us over the last few days, your continued support and kind words really do make it all worthwhile. weekend please print the ticket here. I shall write a full post Olympia and NEC review in our December newsletter. In todays fast changing marketplace, with the seemingly daily demise of major high street brands, coupled with consumer confidence increasing in online shopping platforms, the changes are bound to have a knock on effect on the good “old fashioned antiques trade”! Just from a personal perspective and in a relatively short time frame we had closed our Bricks and Mortar premises in the New Forest, heavily invested in an online gallery, whilst continuing to attend numerous fairs throughout the country. The balance as with any retail business is keeping overheads down and footfall up, whilst ensuring your clients remain satisfied with both the quality of your works of art and the service level being provided. Just one example of a recent situation we faced, whilst we never fall into the trap of buying specifically for antique shows, we do have to have an eye on the layout of our stand weeks if not months before the event. Naturally this leads to items of a certain size or importance being “notionally reserved “ to fill that valuable space, to enhance our presence at the fair, whilst giving our important visitors a worthwhile and enjoyable experience. Leading up to the last two Olympia events we had booked extra space at considerable expense, firstly to exhibit in July a huge Silk wall hanging, previously housed in a New York private collection. Laterly for this Winters event we had earmarked a monumental Exhibition quality Gold lacquer Shodana as the centrepiece of our display, this cabinet had stood in a large house in the North of England since 1951 until our recent acquisition. 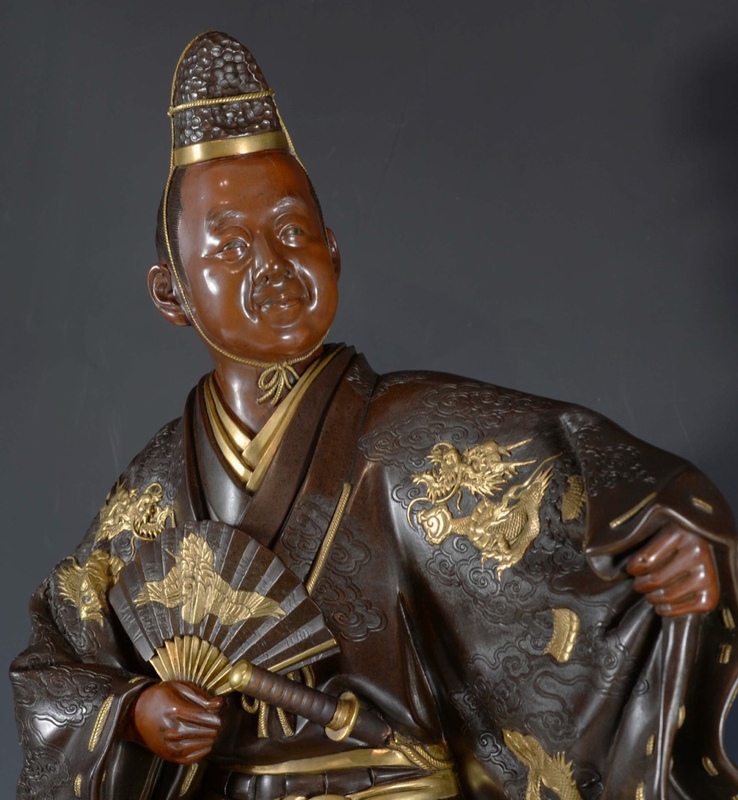 Prior to each event both of these historically important items had been sold to a Japanese works of art collector. Whilst we are saddened that our other clients did not get to enjoy them, we were delighted to add them to this major collection. 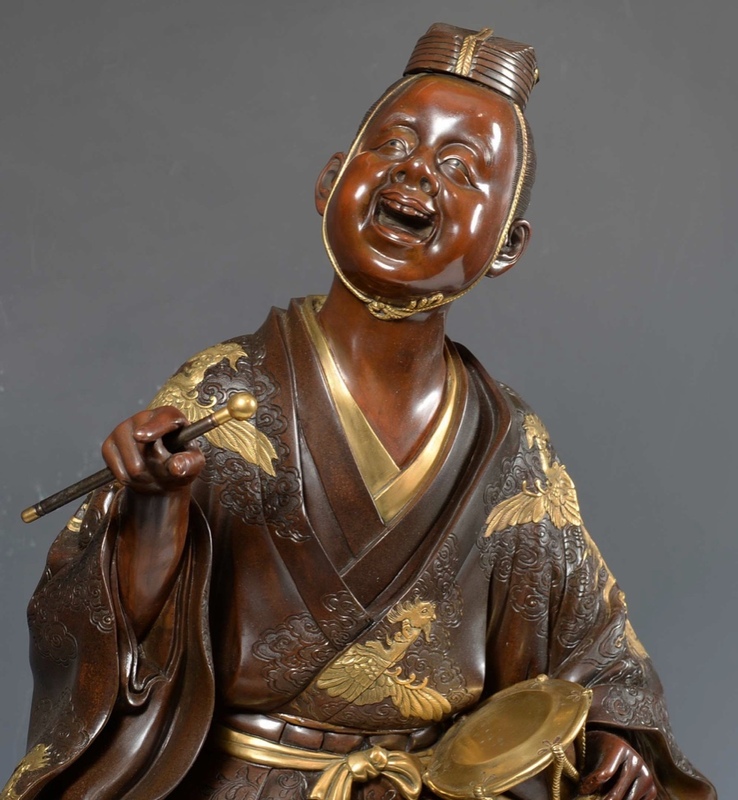 Meanwhile we will continue to address the difficult balance to try and offer our latest Japanese works of art to our exhibition visitors as well as our online members area subscribers and extensive client database. 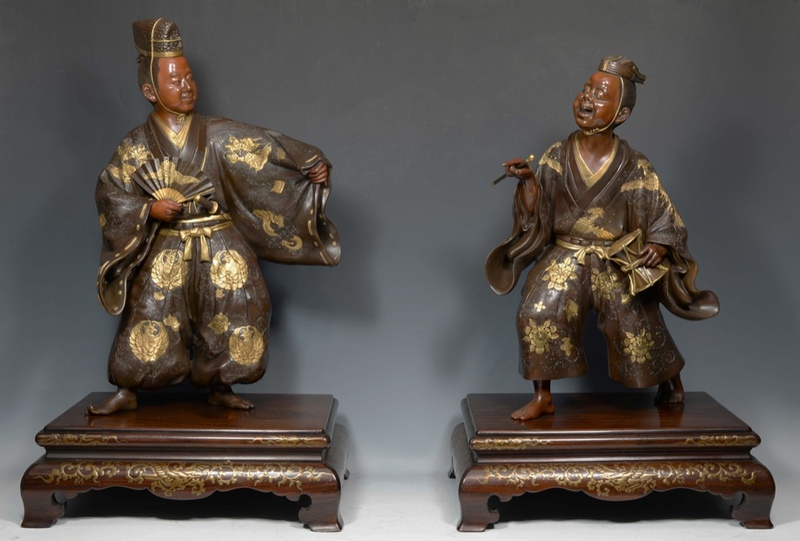 In this months members area we feature this large exceptional quality pair of Bronze and parcel Gilt Okimono of Noh actors, once again “Market fresh” direct to us from a USA Collection. Our final event of the year will be the ever popular Antiques for everyone, 15-18th November at Hall 12, NEC Birmingham, Ryan and I look forward to seeing you there, most of you will have received postal tickets, please feel free to download any extra tickets you may require here.